An electron microscope image of the porous hydrogel. Image: UNH. Researchers at the University of New Hampshire (UNH) have created an easy-to-make, low-cost injectable hydrogel that could help wounds to heal faster, especially for patients with other health issues. Wound healing can be complex and challenging, especially when a patient has other health obstacles that seriously impede the process. Often injectable hydrogels are applied to irregular shaped wounds, like diabetic ulcers, to help form a temporary matrix, or structure, to keep the wound stable while cells rejuvenate. The caveat is that current hydrogels are not porous enough to allow neighboring cells to pass through to help the wound mend. In the study, recently reported in ACS Applied Bio Materials, the researchers outline how they made a macroporous hydrogel by combining readily available gelatin microgels – hydrogels that are a few hundred microns in diameter – with an inexpensive enzyme called microbial transglutaminase (mTG). Gelatin was used because it is a natural protein derived from collagen, a protein found in connective tissue in the body such as skin. Assembling these tiny microgels with mTG helped create a hydrogel with large enough pores for the neighboring cells to move into the wound for repair. In addition, this new injectable formulation allows for the slow release of protein drugs such as platelet-derived growth factor (PDGF) to aid wound healing. The researchers compared conventional nonporous hydrogels with the new macroporous hydrogels, and found a notable increase in the migration of tissue cells inside the hydrogel, which is the hallmark of wound healing. 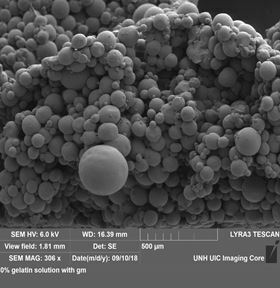 Along with diabetic ulcers, the macroporous hydrogel could help with healing of wounds on the skin, cornea and internal organs during surgery, as well as having military implications. This story is adapted from material from the University of New Hampshire, with editorial changes made by Materials Today. The views expressed in this article do not necessarily represent those of Elsevier. Link to original source. Self-healing, injectable, multifunctional wound dressing based on a micelle-hydrogel composite is flexible and comfortable enough for joint injuries. Scientists have developed a method for allowing materials to self-heal cracks at temperatures well below freezing.